Hail to the Princess Aurora! All of her subjects adore her! Hail to the King, hail to the Queen, hail to the Princess Aurora! Given that Sleeping Beauty was always my favourite Disney princess, it was always likely I’d feel the urge to buy Zoya’s Aurora nail polish – and yes, I totally buy cosmetics based on the product names. Thankfully, the colour turned out to be pretty stellar. Shimmerfish is a super shimmery (surprise!) silver with teeny-tiny flecks of light copper also swimming in the mix. It has the same kind of mottled glittery foil finish (a la Chanel Graphite, OPI Warm & Fozzie and Butter London Wallis) that is absolutely my favourite kind of complex molten metallic; in fact, it reminds me of OPI’s Designer De-Better, which was from the same Muppets Collection as Warm & Fozzie – check out my friend Eugenia’s swatches of that here for comparison. Just like the sun sparking on ocean waves, Shimmerfish totally dazzles when the light hits it – resulting in brightly glistening flashes of silver at your fingertips. But those coppery flecks keep things equally awesome in the shadows too, delivering a coolly complex shade that you just can’t quite put your finger on – is it a silvery bronze… a bronzy silver… a rusty rose-gold… a champagne-taupe… or some equally intriguing new shade that doesn’t even have a name invented for it yet? 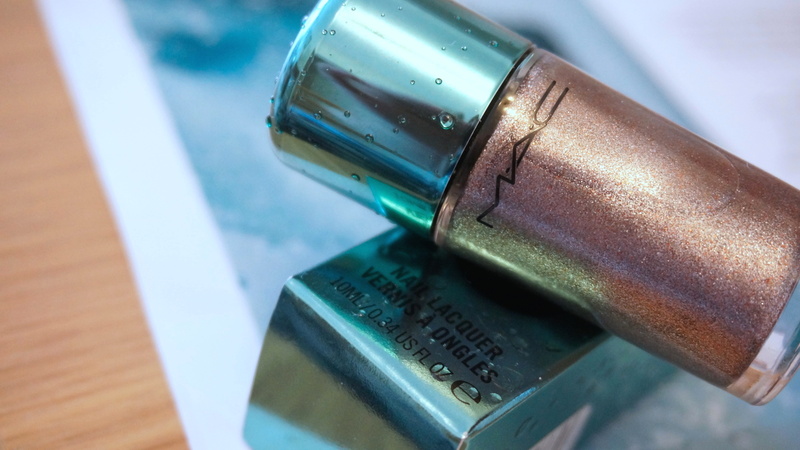 As soon as I saw the amazing packaging for MAC’s Alluring Aquatic Collection – turquoise (squee), metallic (double squee), gorgeous pretend water droplets sprayed onto the casing (stop, seriously, can’t breathe) – I already knew I needed all of it in my life. In fact, I barely even bothered to look at the colours of the make-up itself before snapping each piece up, as every single synapse in me was squealing “BUY, BUY, BUY”. 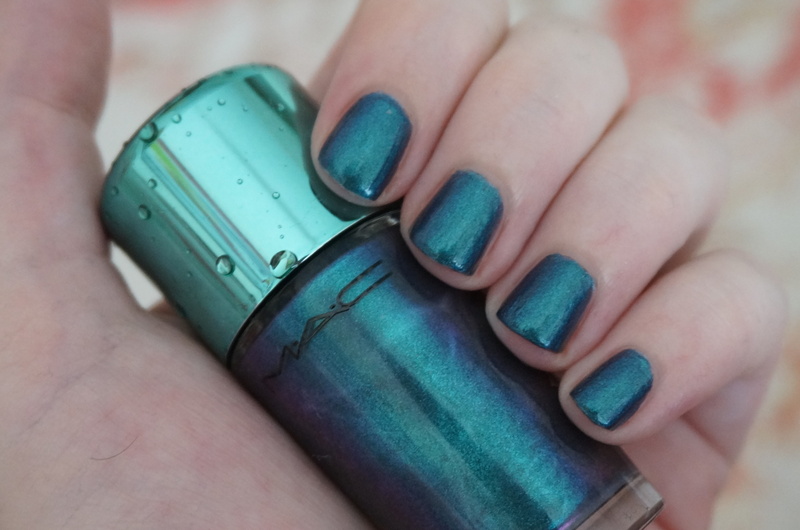 Thankfully, the colours are all actually very nice, and my top nail polish pick – MAC Submerged – very much leads the flotilla of fabulous! Submerged is absolutely the kind of stunning colour you would hope to find in a collection inspired by all things seductively sea-like. 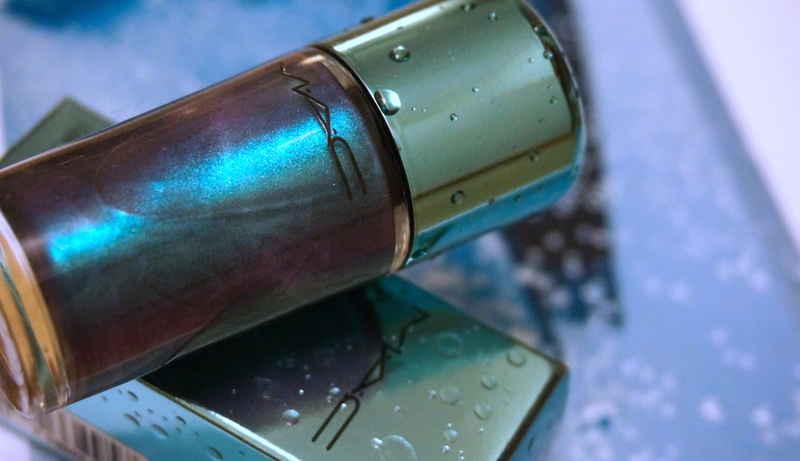 A deep metallic ocean-blue that flashes brilliant teal and dark indigo-violet in different lighting and angles, it’s what us nail polish folks call a duochrome (or more accurately here, a multichrome) – lacquer geek speak for a polish that shifts colour in a similar way to an oil slick. For Submerged, I’d say the colour shift is a bit brighter and more obvious in the bottle, but it’s still very pretty on the nail too. So, I have a confession. Last weekend, I painted my own nails for the first time in over a year. 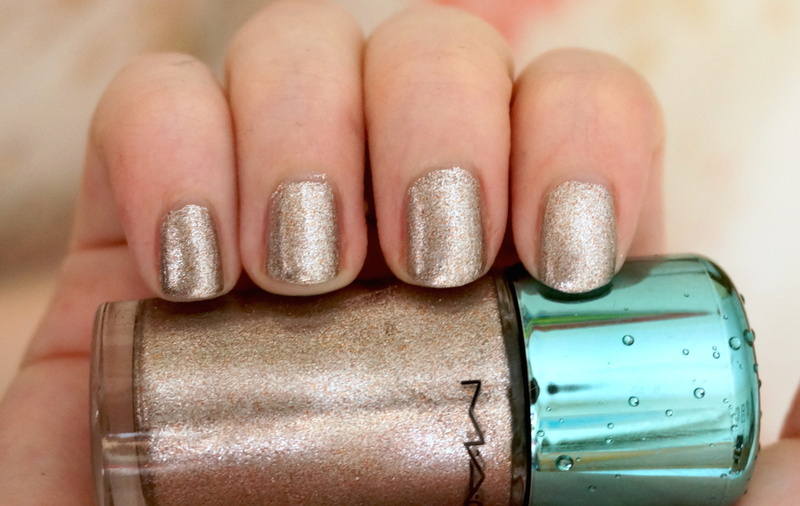 For a blog practically founded on a passion for all things polish, this was not ideal. However, if ever there was a polish that was going to get me out of my lacquer blues, it was going to be HARE Polish Bisbee 2.0! For those not on-board the indie nail polish train yet – come join us on a trip to wondrous faraway lands of glittery, multi-coloured uniqueness! These mysterious places may occasionally be hard to find, but that just makes reaching them all the more sweet… and such is the case with Bisbee, which I had lusted after for about four years before finally getting a taste of its turquoise-and-golden goodness. 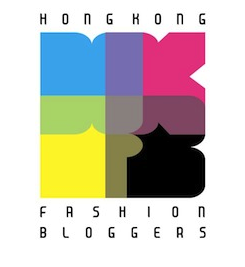 MAC Stay Pretty Pro Longwear Blush & Sunny Seoul Cremesheen Lipstick review – think pink! 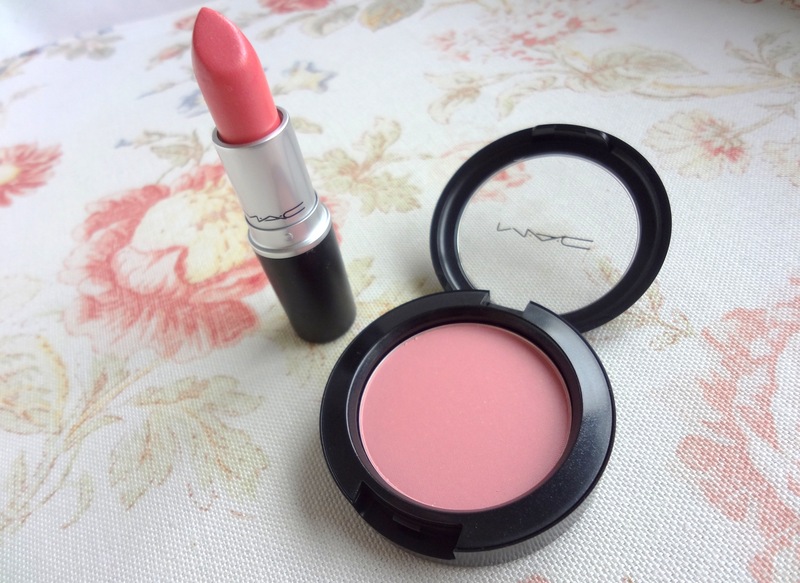 Remember when I went all coral cray-cray with my review of MAC’s Coral Bliss Lipstick and Stay By Me Blush (basically a distillation of the fact I’m actually coral cray-cray for life!)? 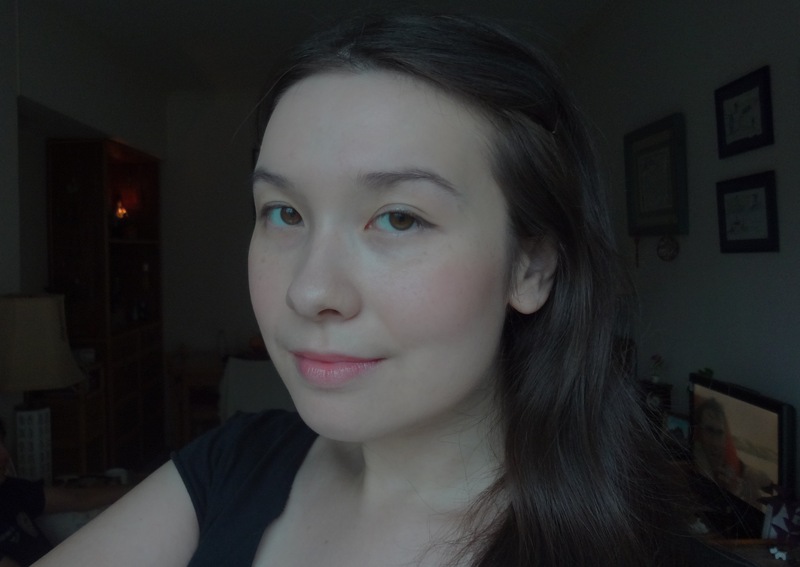 Well, I decided it was time to give some love to the other shades on the blush spectrum and step out of my coral comfort zone, in the form of a pretty-in-pink look using MAC’s Sunny Seoul Cremesheen Lipstick and their Stay Pretty Pro Longwear Blush! Ta-da! It seems my love of desserts is starting to spill over into my love of nail polish… nearly every polish I wear these days reminds me of something deliciously edible! So after the blue strawberry slushie of pa AA162, the choc mint milkshake of Deborah Lippmann’s Rockin’ Robin and the cupcake-inspired Nail’s Inc Sprinkles Collection, it’s time for a set of polishes inspired by ice-creams – Etude House’s Sweet Recipe Collection. 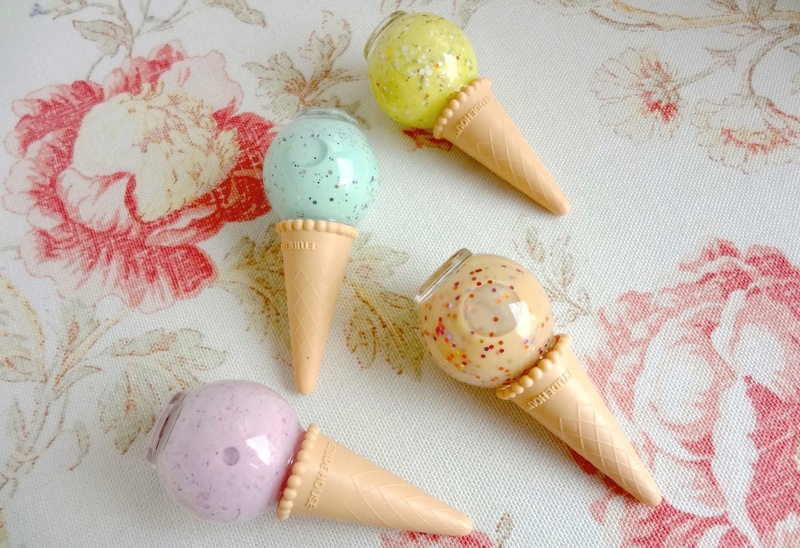 Etude House is a Korean cosmetics brand famous for cutesy girlie designs and playful fun packaging – and their adorable ice-cream cone nail polish bottles have got to be some of their best work yet! The first one I have to show you is probably my favourite of the bunch, Mint Choco Chip… and yes, how did you guess, it involves yet another variant on all things turquoise!